©2011-19 paulf. All rights reserved. 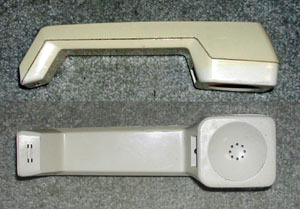 focusing on handsets made for commercial use after 1908 and before the Bell System break-up in 1984. 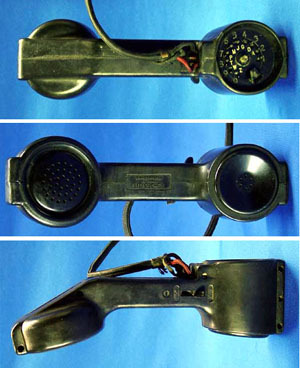 Handsets with numeric codes were primarily used internal to the Bell System for test sets or specialty applications (e.g. intercoms) -- only occasionally in general subscriber environments. 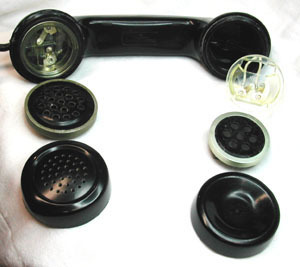 and were combined with "handset mountings" to create a whole telephone. different terminal, switch and wiring arrangements. See the catalogs or BSPs for details. There are undoubtedly more BSP references to be found. 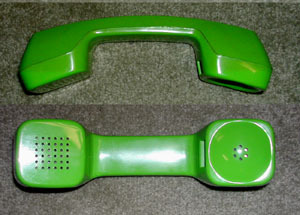 Color information is on the page "Phones in Color!" 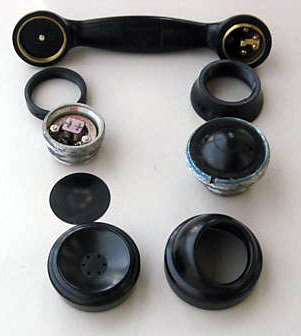 Handset mountings are covered on WE Handset Mounting Types. Follow links where available to detail pages highlighting the major variations. see "A History of Engineering & Science in the Bell System, The Early Years," pp. 138-153. This is a work in progress. Please send comments, additions and corrections. 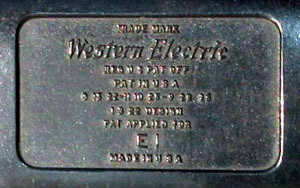 Originally used by linemen. 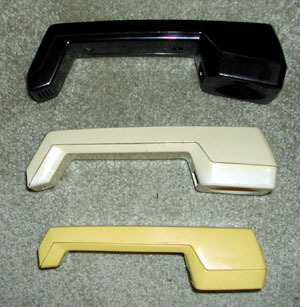 Variations with pushbuttons could be used as desk stand replacements (e.g. 1040AL). Introduced ca. 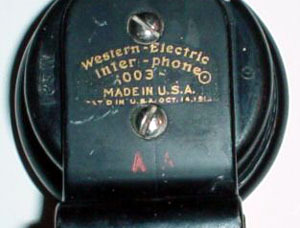 1902. Produced and in service for decades. 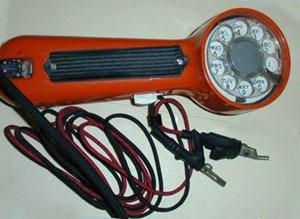 Numerous variations were produced with different switch and cord configurations for many uses. See the catalogs and BSPs for details. 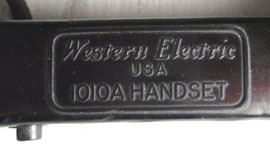 Model numbers were stamped on the handle and omitted the initial "100." e.g. 1A, 1C, 1H, 1J, etc. 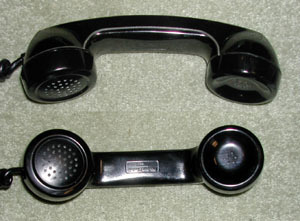 The ring is connected to a line switch, which goes off hook when the handset is removed from a hook. WE Railroad Tel. and Selective Apparatus, 1922, p. 10. 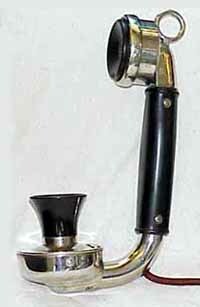 Initially produced in the WE Hawthorne Works - later moved to Antwerp, as most were used in Europe. 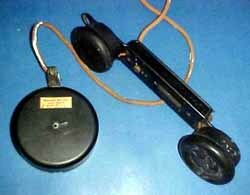 History of Engineering & Science in the Bell System, The Early Years, pp. 140-143. 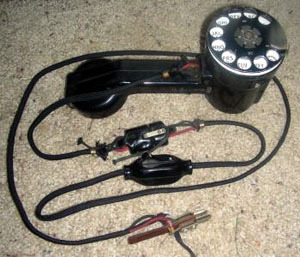 Note: The handset is sealed, with no apparent way to get in to change elements or the cord. Introduced ca. 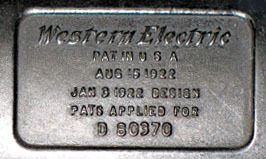 1939. 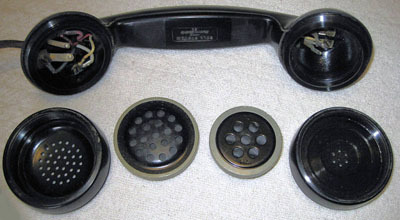 "Dial-in -handset" became the inspiration for the Trimline decades later. 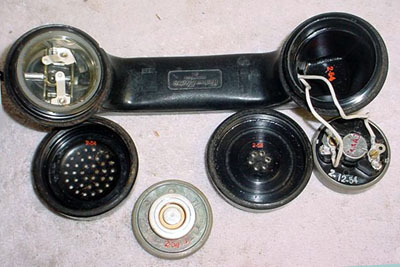 C - G - 3" 6A dial, 346A plug and various cords and specialty connectors to fit equipment to be tested. 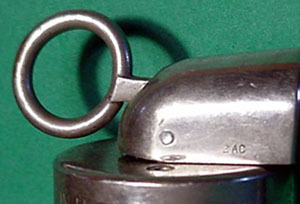 A KS-16360 Snap is available for carrying the hand set on a lineman's belt; this snap must be ordered separately. 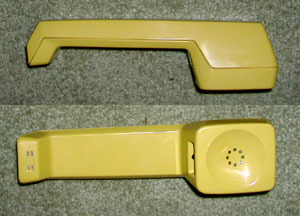 1001-style handle with F handset caps and elements. Colors and cords vary by model and intended use. Yellow - 1014, 346A plug, various cords and specialty connectors to fit equipment to be tested. 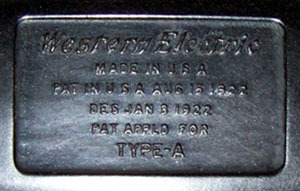 Since sets were used by technicians, found sets often had cords and plastics changed -- including two-tone sets (e.g. half blue and half orange). Components and construction vary by model variation. 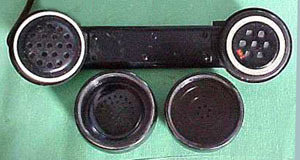 Sets using the same or very similar castings are also found from other companies, such as the AE Model L-965, Bulletin 703-965. Introduced ca. 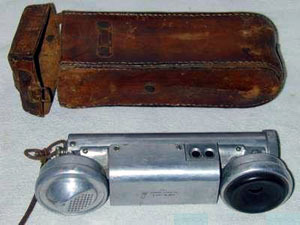 1922, with several versions produced until about 1924. 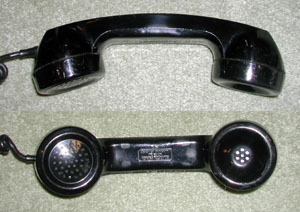 Starting in 1935, the E1B included the F1 transmitter developed for the F handset. 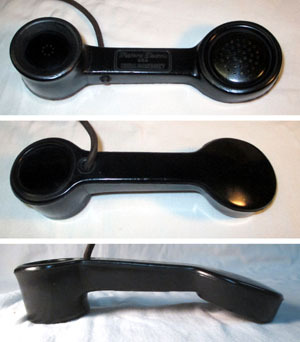 For details and variations, see "Desk Telephones of the Bell System" by Lawrence Wolff. Introduced ca. 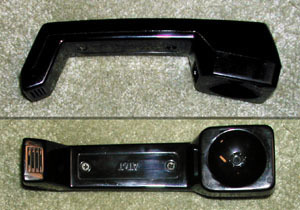 1936 in bakelite. Went to plastic in the early 1950s. 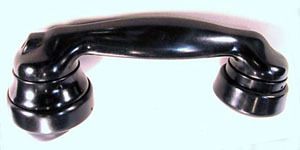 Uses G1 or G3 handle with adapters to hold the F1 handset's F and HA elements. 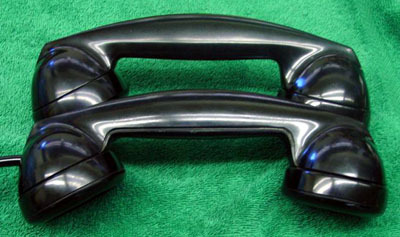 Introduced in 1949 in bakelite. Went to plastic in 1953 for colored sets and the mid-1960s for black sets. 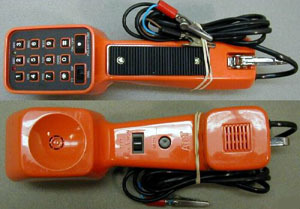 Control of 1-type telephone reporting set from a remote line. Similar to G5 with a switch controlled oscillator for generating a 1475 cps signal. 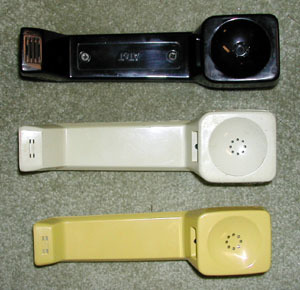 R, M and N Handset size comparison.